Guest-penciler ADRIAN ALPHONA (co-creator of RUNAWAYS) joins UXF! Psylocke digs deep into Bishop’s head and what she finds will shock you! 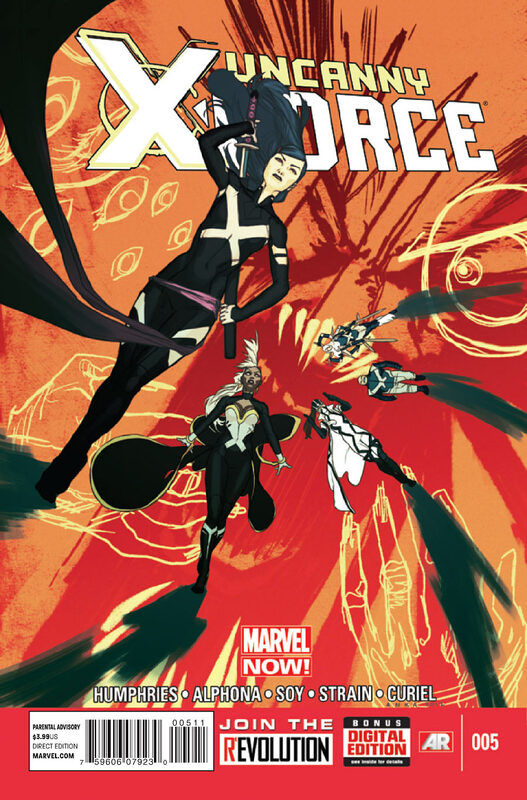 One of the biggest X-Villains of the past 20 years threatens the Uncanny X-Force! Cover- The standard cover looks good, with the team casting shadows on a background clearly meant to represent Bishop’s tortured mind. Reform- This issue makes an honest attempt to add the recently overlooked human side to Bishop’s character. Ever since Hope Summers was born Bishop has been a one track villain without any other dimension despite all the work that Claremont did with him in the 90’s and early 2000’s. Now we have a Bishop that sure he may or may not try to kill the X-men when this is all over but he’s also sympathetic and caring. THAT is a huge improvement over the “kill Hope at all costs” psycho that has stalked the X-men in recent years. Art- The interior art looks good, especially the panels depicting Bishop’s mind on the astral plane. Black Heroes- Bishop is here and so is Storm, the latter doesn’t get used to any great effect unfortunately which seems to be typical for her in this book. Meh- So Psylocke’s body is stolen by the female Fantomex (cluster?) I don’t know about anyone else but having three different versions of Fantomex has not worked out to be as fun as one would have expected. The execution is off, way off! Instead of adding anything to the story it just makes me roll my eyes and scoff every time one or all of them show up.